It’s tempting to describe The Glass Man as the first age of austerity drama to hit cinemas, the first British movie to acknowledge the depreciating status of its middle classes. This group might have ridden out past recessions but in the 2010s there’s little refuge from monsters like debt and unemployment. It’s not a pretty watch, either thematically or literally. Christian Solimeno, an unlikely auteur perhaps, given his acting pedigree with low rent titillation TV like Footballer’s Wives, has improbably crafted the first important film of the year. Only at the end do you know it’s a crime drama, an urban noir, and it’s only in the final twenty minutes, in which Nyman’s desperation and fractured id bottom out, that pity is retrospectively reconstituted as tragedy; the film you were lead to believe was a sedentary lifestyle drama with a criminal complication, reveals its social conscience. Solimeno’s screenplay has great depth and an intense focus, pivoting on the psychological state of his vulnerable lead. It’s regrettable then, that the film is cinematically illiterate, that Solimeno’s skills as a filmmaker can’t meet the challenge of translation he’s set himself. Debutant creep is manifest in its featureless cinematography. Harsh Television lighting, over shoulder shot reverse shot, characters awkwardly filling the frame; these are the signature lapses of a director who’s either uninterested in, or oblivious to style. It’s not that Solimeno lacks a filmmaker’s eye, there are some inventive touches – a shot looking up a Nyman that uses the angles of the surrounding staircase to create a vertiginous sense of disorientation that Hitchcock might have enjoyed, a POV approach from a visiting loan shark, punctuated by steam from cold breath (a shot that becomes problematic with hindsight), but for the most part the frame lacks depth or expressivity. How you miss a sense of atmosphere, a mood captured on film and the cinematographic possibilities that might have added shade and psychological nuance to sets and faces. Watching Nyman’s performance, a career defining performance, that uses understatement to great effect, you’d give almost anything to see the man lit by Greg Toland or Russell Metty. Necessary economies are a constraint on low budget cinema, and one would rather the film existed than not, but if ever a production would have benefited from art direction and a run of film through the camera gate, then this, surely, was it. Still, Solimeno’s film has enough psychological intensity to be engrossing despite its clean look. It’s a deeply affecting study in human failure; the kind of film that makes you turn blue at the close from forgetting to breathe. Nyman creates an everyman who’s a hair’s breadth from falling down, and that tension drives the film, only gaining greater intensity when a late shift, handled with great subtlety by the director, adds a sinister coda to his troubles. 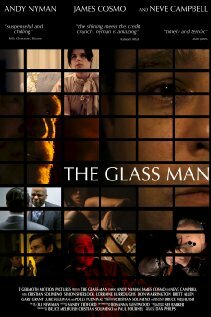 The Glass Man’s a thoughtful and timely piece of work. Let’s hope it finds a large audience.